MIXING WEEK: Super-wide mixes often sound impressive in stereo, but this isn't much good if carefully-adjusted frequency and dynamic relationships crumble over a mono playback system. Luckily, mid/side processors are more common than ever, so you can strike the perfect balance between width and mono compatibility. Less important stereo sound effects and details can sit out to the sides of a mix, but core elements - drums, lead, bass and vocals - must maintain a strong mono presence. Get into the habit of regularly summing your master channel to mono as you compose and produce, so that you can address any phase compatibility issues straight away. In this walkthrough, we'll show you a number of things that can be done to ensure good mono compatibility in a stereo mix. Step 1: Our basic mix has a drum beat, synth bass and reverb FX. 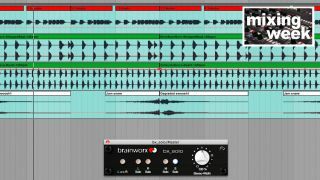 The free Brainworx's bx_solo is loaded on the master channel. This plugin enables you to monitor the track's mono information and stereo information independently. Step 2: The bass features a heavy chorus effect, which has created an excess of stereo low frequencies. When we listen to the side signal of the drums in isolation, it's clear that the low frequencies of the snare and toms are a little too stereo. Step 3: Setting bx_digital's Mono-Maker knob to 210Hz sums any frequencies below this value to mono, cleaning up the mix. A high shelving cut to the sides and corresponding high shelving boost to the mid bring out the bass's top end, helping it to cut through when summed to mono. Step 4: Now to the main drum loop: bx_digital notches -6dB out of the sides at 125Hz, carving out the fundamental frequency of the snare in the stereo field. A couple of gentle boosts to the mono signal again help to rebalance the tone of the drums slightly. Step 5: Sound effects are usually the widest elements in a mix, and the reverb effects here could be much wider. We load Voxengo's free MSED and raise the gain of this channel's side information by 5dB, increasing its stereo width in the mix. Step 6: To finish, we A/B the original track and the newly-processed version. Our improvements have given the mix a higher degree of mono compatibility, without sacrificing too much width. From here, we can head back in and adjust settings to taste. MusicRadar's Mixing week is brought to you in association with Softube. Check out the Mixing week hub page for more mixing tutorials and tips.